This recipe is a courtesy of chef Anthony Sedlak. It looked amazingly good when i saw it onhis show and came out to be above my expectations. Preheat oven to 450. Heat olive oil in large, wide, oven-safe skillet on medium heat. Sear chicken, skin side down first until deep golden brown. Set chicken aside. Gently fry chorizo for a minute or two, then add onion, garlic and sweat until onion is soft. Add rice, paprika and stir, toasting rice for 3-4 minutes. Add saffron, bay leaf, white wine and chicken stock; bring to simmer and season lightly with salt and pepper. Return seared chicken back to pan. Add clams and tomatoes. Place in oven on middle rack and roast, stirring occasionally, until rice is three quarters done, about 15 minutes. Add mussels and shrimp to pan and continue to roast until mussels open and cook through, about 6-8 minutes. Remove from heat, season with additional salt and pepper to taste. WOW,this sounds great!Definetly saved in my recipe book!I jus dont know about the mussels,never had em!Makes me nervous!Haha!But everything else sounds deeelish! 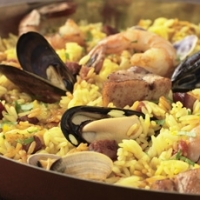 The sweet smoked paprika and saffron are a great addition to a recipe like this.Paella is a wonderful dish to start out with a big hit with me and my friends fir sure. I make something similar, with just mussels and rice. I love the way rice gets inside the mussels when they open, and almost stuffs them. Your recipe is so much better than what i make! It has great combo of ingredients and flavors going on. Next time I make this, I'll follow this recipe, thanks! Flagged you for beauty! My daughter and I took a paella class at Cafe Baba Reeba in Chicago...your recipe looks like another I will have to try - such wonderful flavors in Paella, and fresh ingredients...I know we will love this one. Printed and ready to try...thanks!